Pashupatinath Temple (Pronouced Pa-shu-pa-ti-NATH) is the oldest Hindu temple in Kathmandu. Although it is not known exactly when the temple was built, most say it dates back to 400 BCE. According to ancient Nepali texts Mahatmaya and Himvatkhanda, the deity here gained great fame here called Pashupati, the Lord of all Pashus. A richly ornamented pagoda houses the huge sacred linga or holy symbol of Lord Shiva. You’ll see a photo below, however non-Hindus are not allowed into the most sacred areas. If you speak to the ascetics that live around the temple, they’ll respond in very good English and may ask you for 1,000 rupees, which is about $10. Hindu ascetics in colorful makeup and dreadlocks earn very good money from the tourists. They may even be very advanced spiritually – I don’t know. I spoke to the one in the middle and his English was perfect. A view of the temple complex and river bank from the topmost level shows it is a huge complex, some of it accessible to tourists, and many areas are restricted. The many beautiful lingam of the temple represent the cosmic union of ultimate reality. This can be seen as the union of Lord Shiva and his consort Shakti. Or it can be seen as the union of male female. Or positive and negative. Or Yin Yang. These are the dualistic rulers of this 3-D dimension in which we live, perhaps ever since the Big Bang separated ultimate reality into physical manifestation. This huge Lingam at Pashupatinath temple is considered the most special, and is restricted only to practicing Hindus. Its uniqueness is due to it’s enormous size, and the four faces on the surfaces. The faces look towards the cardinal four directions. The one facing East is called Tatpurusha, the one facing West is called Sadhyojata, the one facing North is called Vamadeva and the one facing South is called Aghora. The uppermost portion of the Shivlinga is called Ishan. The four directions are sacred in many spiritual traditions, including Hinduism. The sacro sanctum, or the main idol, is a stone Mukhalinga with a silver yoni base bound with the silver serpent. The lingam is one metre high and has faces in four directions. Each face has tiny protruding hands holding rudraksha seed mala on right hand and a kamandalu on the other. Unlike other Shiva lingams in India and Nepal. this Pashupati Shiva lingam is always dressed in its golden vastram except during abhisheka festival, so pouring milk and Ganga Jal is only possible during the festival of abhisheka by the main priests. This is tika powder, used to adorn the forehead. The paste is made of very bright red vermillion powder, rice and yoghurt. This smiling lion guards the entrance to the sacred interior of the temple. My visit was stopped at this point, as non-Hindus are not allowed to enter. Was it my lily white skin that made them see me as a non-believer? No problem. I just wanted to admire the lion. The temple security (Armed Police Force Nepal) are very selective about who is allowed into the inner courtyard. Only practicing Hindus and Buddhists of Nepali origin are allowed into the Temple courtyard. Practising Hindus of Western descent are not allowed into the temple and must go with the non-Hindu visitors. An exception is granted to Sikhs and Jainists, who may enter the temple if they are of Indian ancestry. Westerners must see the main temple from the other side of the river. I paid a $10 tourist fee (1000 Nepali rupees) to visit the cremation area and some of the hundreds of small temples in the outer complex area. 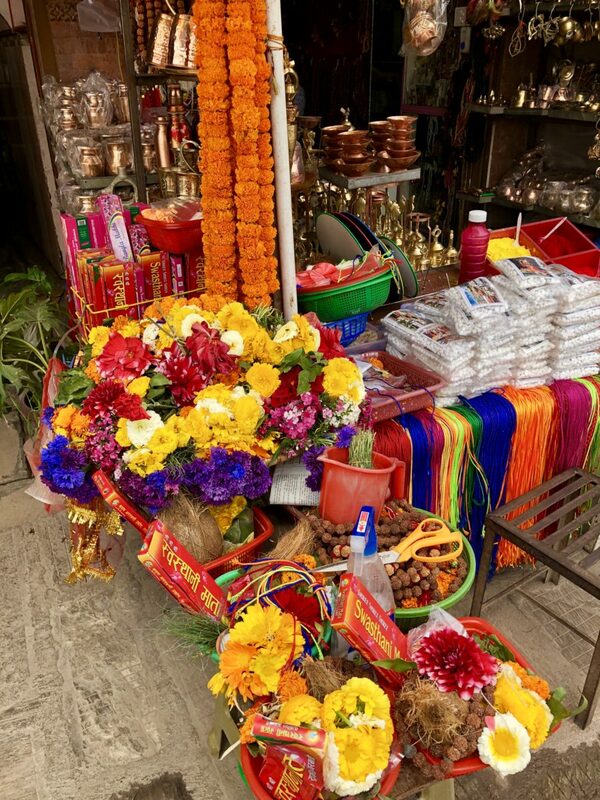 As you approach the temple, there are rows and rows of flower and souvenir carts along the streets. At the arched main gate, we were asked to remove our shoes, so all visitors are barefoot. Every day on the bank of Bagmati River, open air cremations take place. The eldest son of the deceased shaves his head and completes the rites, dressed in white, assisted by other sons and relatives. The cremation is quiet and very respectful. Today there were cremations for two families. You can watch them light the fire with a torch and add straw to feed the flames. Vendors offer rudraksha beads, flowers and souvenirs for visitors, who come from all Hindu areas of the world. Monkeys everywhere today. This one came to perch next to me and gnaw on a banana. I asked for a blessing and reading with this charming fortune teller. He read the lines in my hands carefully. There was a little language issue, and it seems a few key words in every sentence were unintelligible. I just listened. I was able to get most of the good news, but missed ALL the bad news. Ha! I wondered, is this some kind of cosmic joke? How perfect! I wouldn’t want to hear his bad predictions anyway. So I was forced to listen only the parts I understood. How can he be expected to speak English anyway? I loved his blessing. He asked me to repeat some Sanskrit prayers, which I did gladly and some I already knew, while holding the framed image. I felt happy and complete. No worries. After that I went to have dahl for lunch. I turned the restaurant upside down with my request for no gmo soy oil. Then came home to work on my book. All is well. Ha ha! About the haircut. I heard from a fellow American about Kaushal, the hairdresser at the Hyatt Oasis spa, and it sounded hopeful. So I took a risk and called him up. When he finished I took a photo of both of us taking a photo. Kaushal worked slowly and did a great job. Ha Ha! It had taken me four months before I decided to risk, as it’s a challenging asymmetrical style. Meanwhile my hair got tired, dry and shaggy. Very pleased with the result. Whaddaya think? The Lama bought us a curtain for the apartment sliding gate with padlock. Yay! Now we’re a little more protected from wind and noise in the building. We made an offering at the Bouddha to celebrate successful progress. After the offering we went out to dinner. This is our Tibetan grace, blessing the meal and the three jewels of Buddhism. People, other than the wise, do not realize, “We in this world must all die,” (and, not realizing it, continue their quarrels). The wise realize it and thereby their quarrels cease. We’re here on the verge of dying. Thanks for checking in! Next week will be more of same. Living and breathing in Kathmandu. See you soon!